I was actually pretty nervous when I remembered that today was the day that the results of my first Classics Club spin were in! I’ve spent the past week or so lamenting my own stupidity at including The Hunchback of the Notre Dame by Victor Hugo. The more I read other participants’ lists, the more I realised that I was not keen on reading it yet at all and the more convinced I became that I was going to end up lumped with it. And so it was with no small amount of relief that I read that the lucky number for this month’s spin is…20! 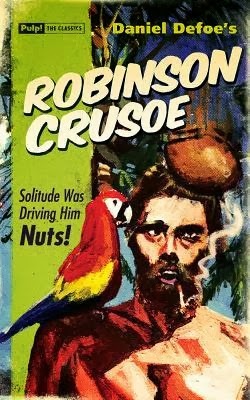 By 2nd April, I need to get my skates on and read Robinson Crusoe by Daniel Defoe. I’ve downloaded a free edition for my Kindle and am actually really looking forward to starting. I added it to my list after enjoying the deferential ramblings of Gabriel Betteredge in The Moonstone. I can’t imagine a much better setting for reading while sheltering from wind and rain than a desert island. To make things even more exciting, it comes recommended by Blonde Ellie. It made it on to my spin list in a section of books that were connected because they all had some link to my childhood. In Robinson Crusoe‘s case, it was because I appeared in a pantomime version of the book when I was younger and so remember the story through a haze of dodgy pirate costumes, backstage giggles and memories of my dear Dad playing Man Friday. I have no idea how much of that particular version was accurate (I expect next to nothing, actually…) but it was a heck of a lot of fun so I’m hoping for a good dose of nostalgia to go with my classic this month!